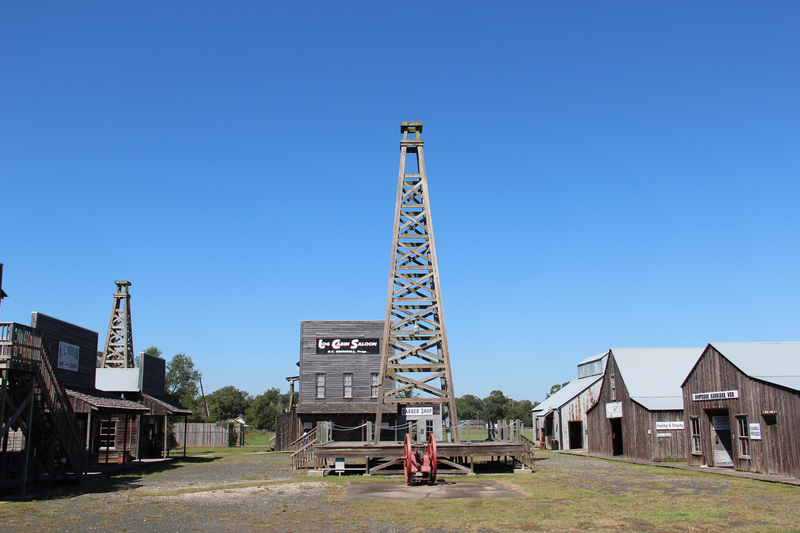 During last weekend we visited Spindletop, Beaumont, Texas. It was there on 10 January 1901 that the oil era really got underway. On that day Captain Anthony F. Lucas and his drilling crew reached 310 metres depth (1020 feet) and the drilling mud, drill and the rest flew up in the air. A moment later natural gas and oil gushed out of the hole and formed a fountain of oil nearly 50 metres high (150 feet). It was the highest oil fountain that had then been seen in the USA and it is estimated that the flow rate was 100,000 barrels per day. During the 9 days that it took before they could cap the hole nearly one million barrels of oil drenched the area. The amount of oil flowing out of that one hole was, at the time, more than the rest of the world’s oil production put together. The population of Beaumont rapidly multiplied and the town that grew up around the Lucas Gusher was called Gladys City. 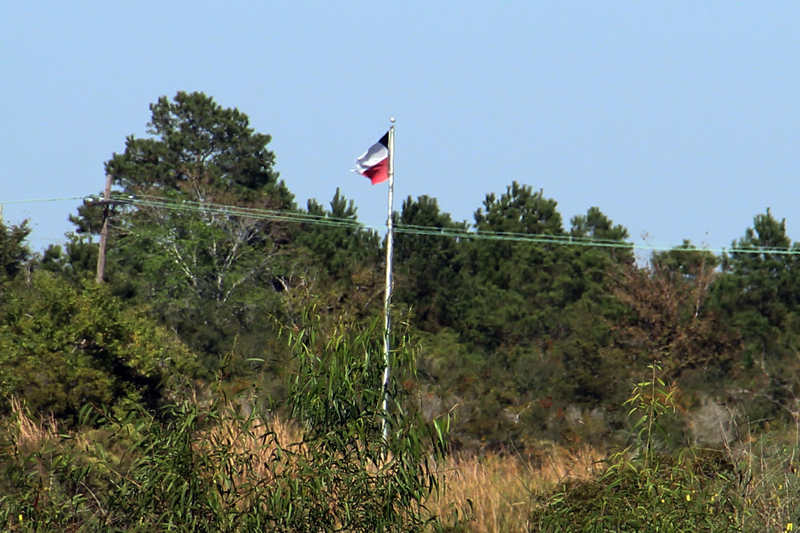 Since the 1970s nothing remains of it – only a Texan flag that marks the site of the Lucas Gusher. 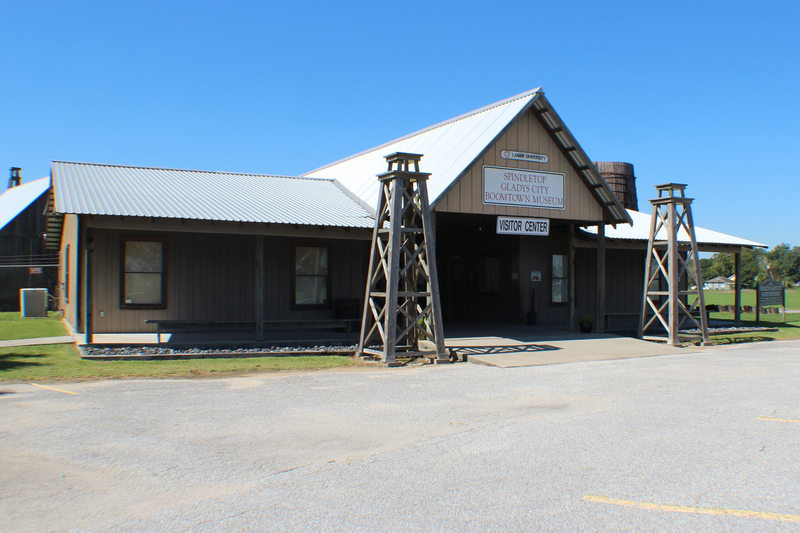 There are still a few wells at Spindletop that produce oil and in the museum that has been built nearby one can buy a little bottle of oil for $3. 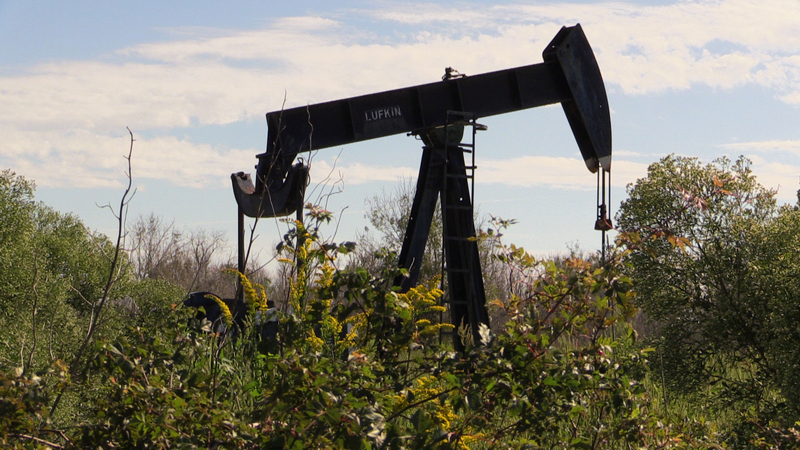 To be standing at the place where the oil era began and see that all that remains is a flagpole and a few squeaking oil pumps is the most obvious sign imaginable that oil is a finite resource. 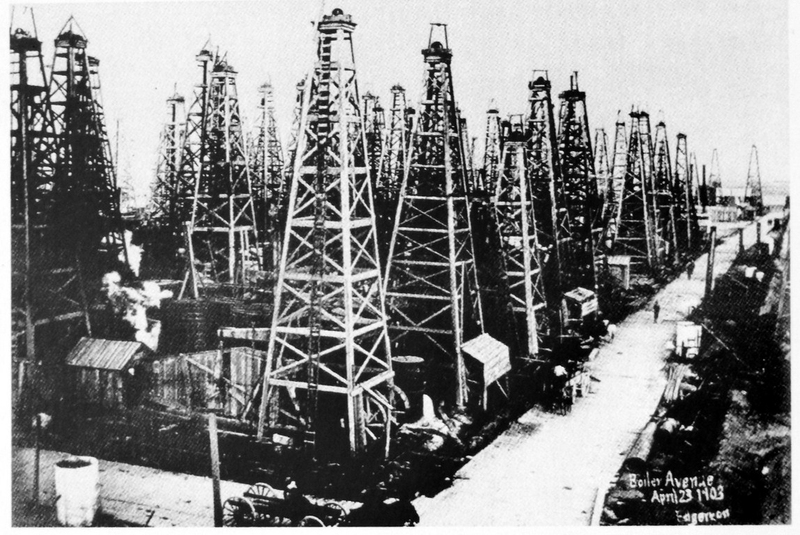 The history of Spindletop is described in many publications, one of which is by the Paleotological Research Institute. I recommend those who are interested to read it. 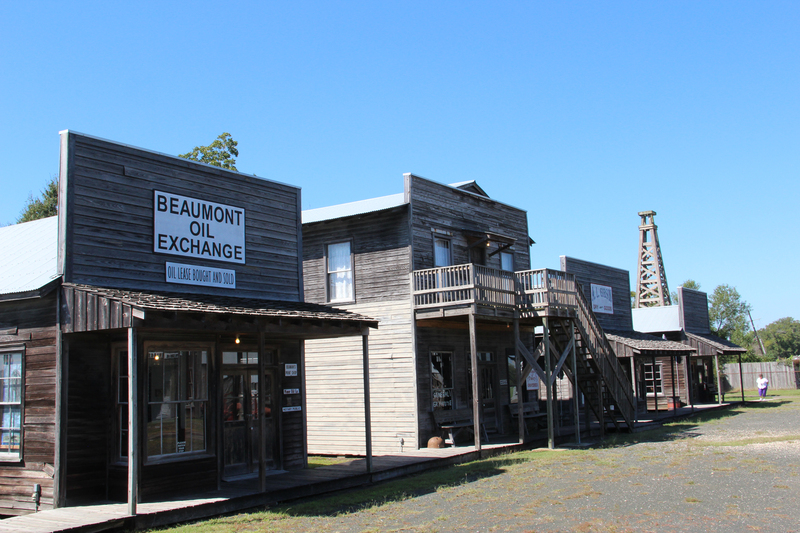 During the 1970s when there was still much remaining of the original Gladys City they decided to recreate the boomtown that had stood there at the beginning of that century. The site they chose to do this had earlier been owned by the company that owned the land around the Lucas Gusher and it was interesting to see the buildings that they recreated. Even though the buildings were new they had tried to retain the original interiors. Below you can see some of the images from the museum and I finished my visit by visiting the bar. 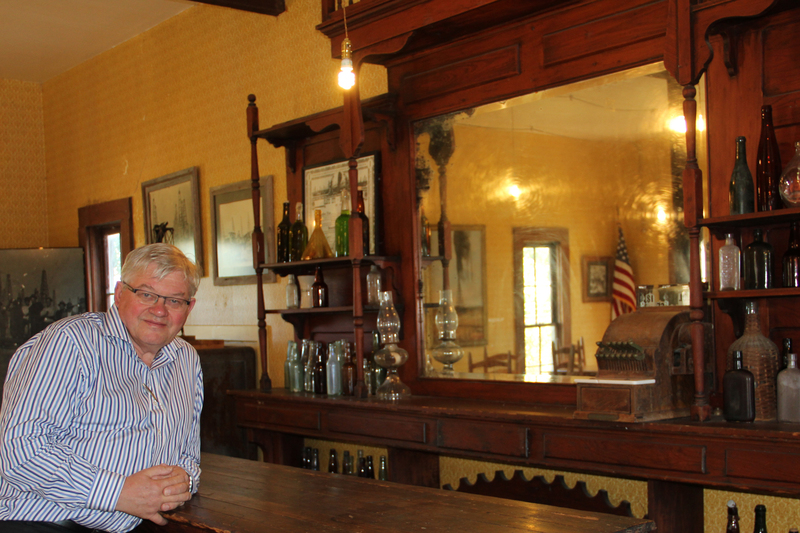 Unfortunately, there was nobody to serve the Spindletop beer that was advertised. That I was able to attend a vintage car display that same day in Beaumont was an added bonus. Under helgen har vi besökt Spindletop, Beaumont, Texas. Det var här som den verkliga oljeeran började den 10 januari 1901. Det var då som Kapten Anthony F. Lucas och hans borrlag nådde nivån 310 meter (1020 feet) och det var då som borrleran, borren och allt flög upp i luften. Efter ytterligare en stund strömmade naturgas och olja ut ur hålet och bildade en fontän av olja som var närmare 50 meter hög (150 feet). Det var den största oljefontänen som skådats, och man beräknar att det strömmade ut 100000 fat olja om dagen. Under de 9 dagar som det tog innan man kunde täta hålet hade närmare en miljon fat olja dränkt området. Den mängd olja som då strömmade ut per dag var mer än den dåtida dagliga världsproduktionen. Under kort tid mångdubblades befolkningen i Beaumonter och den stad som byggders upp runt Lucas Gusher kallades för Gladys City. Sedan 1970-talet finns det inget ting kvar av detta, bara en Texasflagga som markerar platsen för Lucas Gusher. Det finns fortfarande några enstaka brunnar vid Spindletop som producerar olja och i det museum som man byggt i närheten kan man köpa en liten flaska för 3 dollar. Att vara på platsen för Lucas Gusher, platsen där oljeeran började och se att det bara återstår en flaggstång och några gnisslande oljepumpar är den tydligaste markering som man kan tänka sig på att olja är en ändlig resurs. Historien om Spindletop finns beskriven på många ställen och ett av dessa beskrivningar är den som Paleotological Research Institute publicerat. Jag rekommenderar intresserade att där läsa med om Spindletop. Under 1970-talet då det inte fanns mycket kvar av ursprungliga Gladys City bestämde man sig för att återskapa den Boomtown som fanns där i början av 1900-talet. Den plats som man valde hade tidigare tillhört det bolag som ägde marken runt Lucas Gusher och det var intressant att det de byggnader som man återskapat. Även om byggnaderna var nya så hade man försökt att bevara de gamla autentiska inredningarna. Här nedan är några bilder från museet och själv avslutade jag besöket med att gå till baren. Tyvärr fanns det ingen som serverade det Spindletopöl som man anonserade om. Att man samma dag hade en veteranbilsdag i Beaumonter blev en extra bonus. 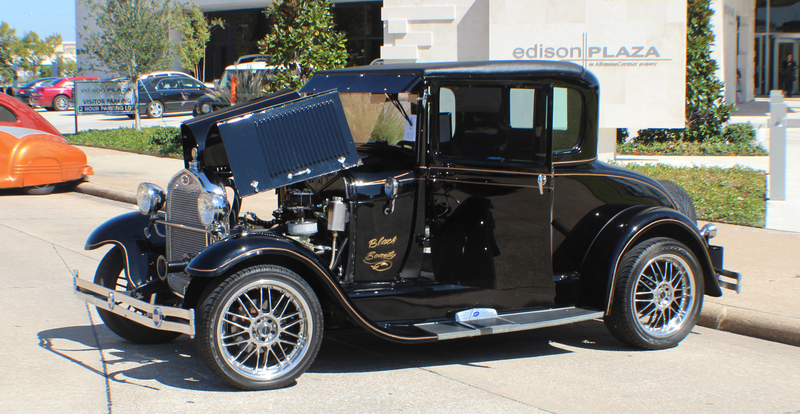 The vintage car is a nice touch… A little newer than Spindletop, but we get the idea. Blame oil depletion on bicycles! Bicycle clubs forced streetcars off the streets of America and forced politicians to pave roads. Jailers supplied copious numbers of colored gentlemen for road gangs… Paved roads brought forth ever greater numbers of cars. Job done, bicycle groups waited 100 years, and now are in the vanguard with well-off NIMBYS preventing rebuild of dormant rail corridors in the USA. 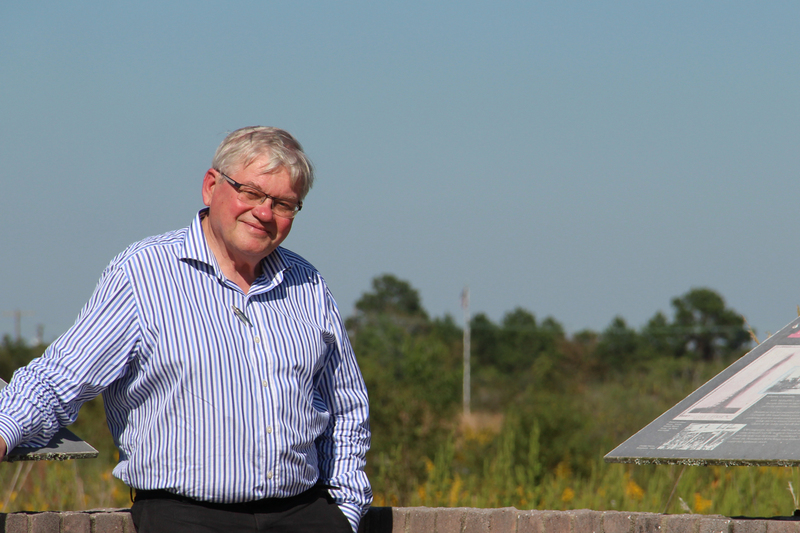 “Rails To Trails” was set as policy for banking abandoned rail corridor for future use. Well, boys and girls, the future is here, we are supposed to let the railroads back so they can help free us from imported oil. And, lessen need for fracking… and pipelines, etc.